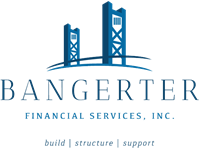 March 4, 2019 - S&P Ends Week Little Changed | Bangerter Financial Services, Inc.
Stocks lost a little ground as February gave way to March. While domestic and overseas political developments made headlines, the market stayed relatively calm: from Monday's open through Friday's close, the S&P 500 ceded just 0.17%, finishing the week at 2,803.69. Last week, Federal Reserve Chairman Jerome Powell told the Senate that Fed officials would take a "patient approach" with regard to future interest rate moves. Powell called the economy "healthy," but noted that "conflicting signals" have emerged in recent months; he said that he was not concerned about inflation picking up in response to wage growth. After making four rate hikes in 2018 and forecasting two more for 2019, the Fed has adopted a "wait-and-see" approach to monetary policy in the new year. Earlier in the week, President Trump opted to postpone the 15% increase in tariffs on many Chinese imports slated for the start of March. He did not announce a new deadline. Thursday, U.S. officials said the deadline had been suspended "until further notice." 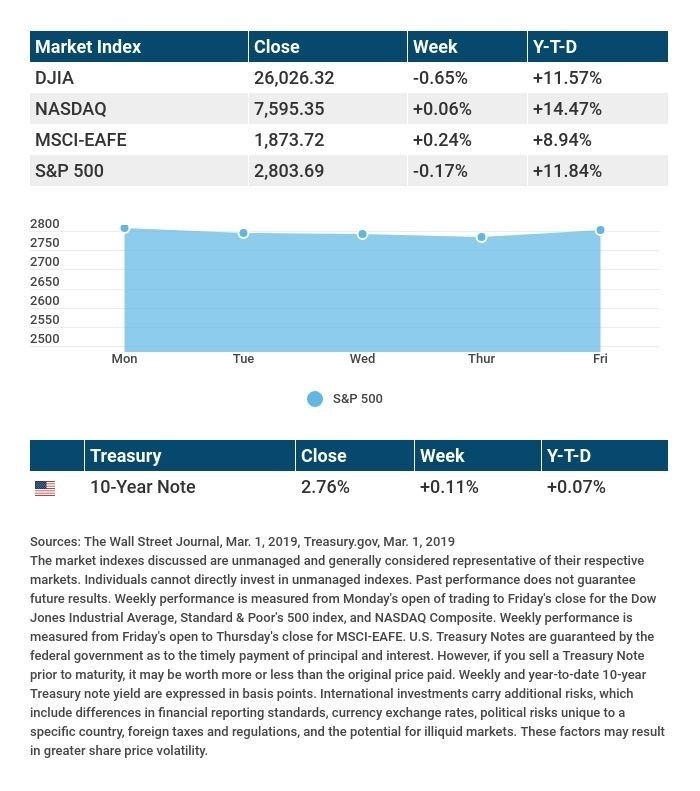 Source: Econoday / MarketWatch Calendar, March 1, 2019 The content is developed from sources believed to be providing accurate information. The forecasts or forward-looking statements are based on assumptions and may not materialize. The forecasts also are subject to revision. The release of data may be delayed without notice for a variety of reasons, including the shutdown of the government agency or change at the private institution that handles the material. Source: Morningstar.com, March 1, 2019 Companies mentioned are for informational purposes only. It should not be considered a solicitation for the purchase or sale of the securities. Any investment should be consistent with your objectives, time frame and risk tolerance. The return and principal value of investments will fluctuate as market conditions change. When sold, investments may be worth more or less than their original cost. Companies may reschedule when they report earnings without notice.